Italy has agreed to take three detainees from the US prison camp at Guantanamo Bay, US President Barack Obama has said. 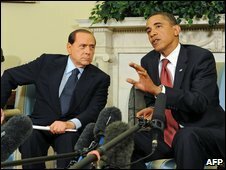 He announced the agreement after talks on Monday with Italian Prime Minister Silvio Berlusconi at the White House. The US wants other countries to accept Guantanamo detainees so the camp can be closed down, as Mr Obama has pledged. The European Union earlier endorsed a deal with Washington to transfer some inmates to Europe. "I... thanked the prime minister for his support of our policy of closing Guantanamo," Mr Obama said after meeting Mr Berlusconi. "This is not just talk. Italy has agreed to accept three specific detainees." The identities of the prisoners have not been disclosed. Guantanamo Bay officials have been attempting to fulfil Mr Obama's order to close the detention facility by early next year. Last week, the US relocated nine detainees from the camp, transferring three to Saudi Arabia, four to Bermuda, one to Iraq and another to Chad. Correspondents say officials are having difficulty finding governments willing to accept the remaining detainees, while at home they face stiff resistance to the idea of Guantanamo detainees being transferred to US soil. Some 220 detainees are still being held at the US camp in Cuba, many without charge. About 50 fall into the category of detainees who are cleared for release without trial, but are deemed to be at risk of mistreatment if sent back to their home country. The joint EU-US declaration on Monday said the decision whether to accept former Guantanamo inmates "remains the exclusive competence of the individual [EU] member states". "By supporting the US determination to shut down Guantanamo, the EU hopes to contribute to changing US policies and help the United States turn the page," the Czech presidency of the EU said. The resettlement of Guantanamo detainees remains controversial because of the EU's Schengen open borders policy, meaning former prisoners would be free to travel inside most of the EU. Under the agreement, the US "will share with the EU member states the available information relevant to ex-detainees received on the territory of the EU member states and Schengen Area". The US also pledged to consider, on a case-by-case basis, contributing to the costs of resettlement. Besides Italy, several EU member states have voiced willingness to accept ex-Guantanamo detainees, including France, the Irish Republic, Portugal and Spain. The UK has already taken in 14 former inmates. Several have also been accepted by Belgium, France, Sweden and Albania, which is not in the EU. The tiny Pacific nation of Palau has agreed to accept 13 Muslim Uighurs from Guantanamo, who fear persecution if they return to China.